Hello guys, I'm back with another Beelzebub discussion here. On the first half of this post I'm going to review the Beelzebub Bangai-hen or the 6 chapters of Beelzebub extra edition Manga. The second half will be my opinion and impression of it, so if you wish to avoid spoilers please leave the second half of this post. The spoilers part will be tagged in the section. 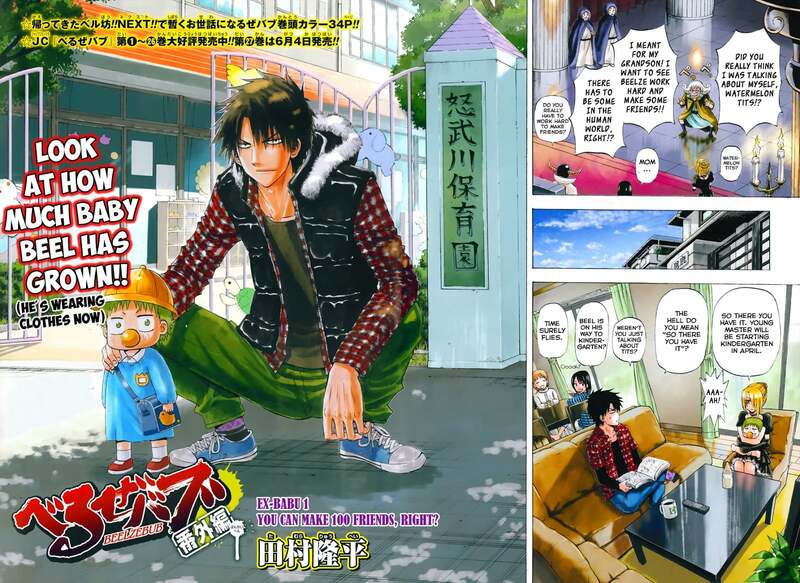 Beelzebub Bangai-hen manga cover and first page. Beelzebub Bangai–hen is the extra edition of Beelzebub manga series from the author, Tamura Ryuuhei. This extra edition is consist of 6 chapters. If you want connect the timeline with the main story, this extra chapter took time on a few months to 1 year after the final battle with Satan. In other words, the events happened after chapter 239, but before chapter 240. If you want to read Beelzebub Bangai-hen chronologically along with the main series, then the order will be like this: 239 -> Bangai-hen -> 240. 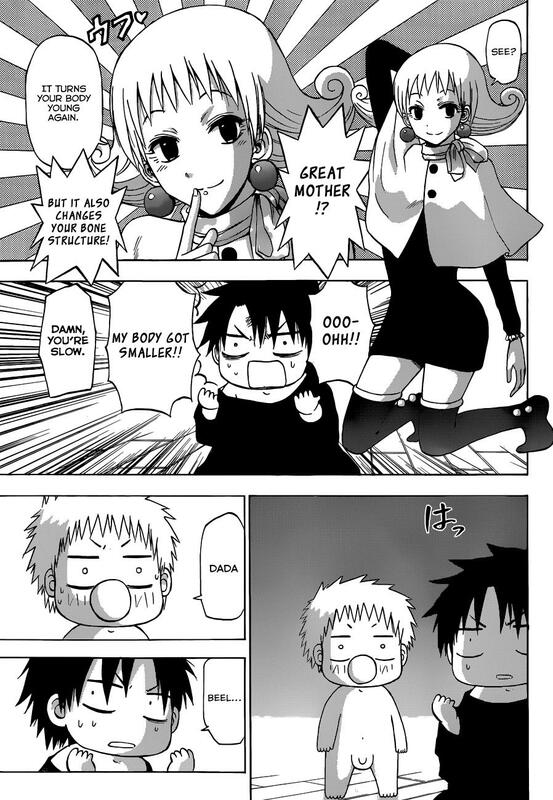 To be honest for me, Beelzebub Bangai hen is just where the author want to have some fun and experiment on his own. There were even this shocking fanservice right of the start. It's like: "Hey let see the fans reaction if I do this, would it be a good work?" As for me who really a big fan of this series, the Bangai-hen was just ruined the true Beelzebub reputation. I didn't hate it, it's just I wish the author could get more serious in the plot. I mean like this is a good chance to solve things left in the main story (read my Impression and Opinion on Beelzebub). If you haven't read it yet, then I just could say to prepare yourself. It will be you like it or you disappointed so much. Oga turned to a child again. On the first arc of Beelzebub Bangai-hen, baby Beel has a mission to make 100 friends. I think the event took time several months after the last battle with Satan. Baby Beel enrolled in kindergarten now, but what’s more? Oga and co. will turned back into child because of some hell's crazy tools Beel's grandmother used. 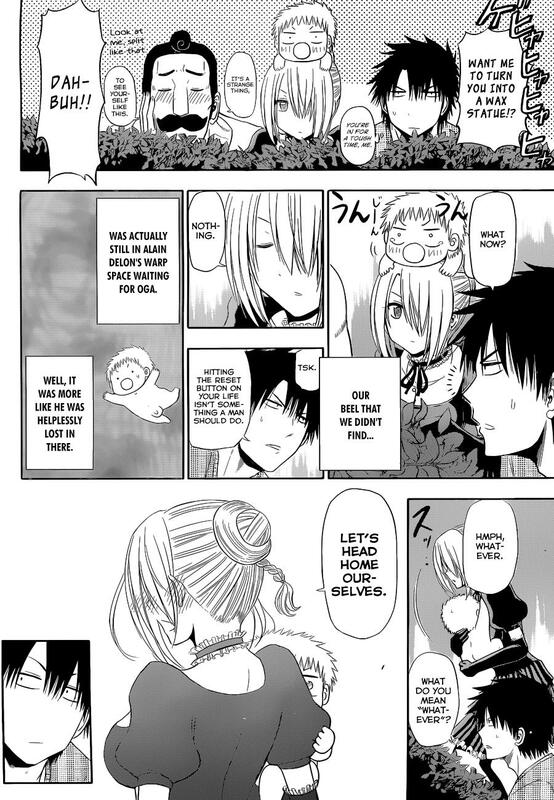 Start from the first page, there were this weird fanservice that never ever should happened to Beelzebub realm. From all the characters this must be happened to Hilda. To me Hilda is the most respected character in the main characters line, with his dedicated loyalty to her master. But truly a disappointment that she must be the one who get a cheap fanservice scene. This 100 friends arc is okay to me though. I like it as it give some refreshment, except the cheap fanservice on the beginning. Well this is the most fun arc on Bangai-hen, except for the swimsuit and again, cheap fanservice part that I think unnecessary. The stranded or demon island arc definitely took time on summer holiday at the next of school year after the battle with Satan. So now Oga and Furuichi are 2nd grader. I said this arc is the most fun because everyone gathering again. The Ishiyama high boys and girls and some of St. Ishiyama horsemen will be gathering on beach for a summer holliday. It was started as a holiday, but in the end they must faced with demon things. Oga and co. stranded in a demon island that try to eat them. Apparently the demon island itself is the culprit of some serial missing people cases. Now they must search a way out to escape from that demon island to save their life. Dr. Folkas on breaking the 4th wall. LOL. For this chapter Mob-ichi,… I mean Furuichi will be the leading role. Still remember Athrun of Hell ? If you don't, read my: Impression and Opinion on Beelzebub. He is one of shelved character because the author had a hard time putting him back to the story. Athrun identity finally revealed on this Beelzebub Bangai-hen. But come on, Athrun was nothing more but a joke. Athrun is a spy who worked for someone who oppose the palace. Maybe he was worked for Satan, or something else. Guess what? He got amnesia -_- . Now Lamia and Furuichi who got a memory of past event related to Athrun must doing memory dive in order to connect Athrun memory and theirs, in order to bring back Athrun memory. Dr. Folkas also make his first appearance here, as in the main story he just a shadow background character. Ahh... I hope to see Kunieda Aoi smile like that forever. 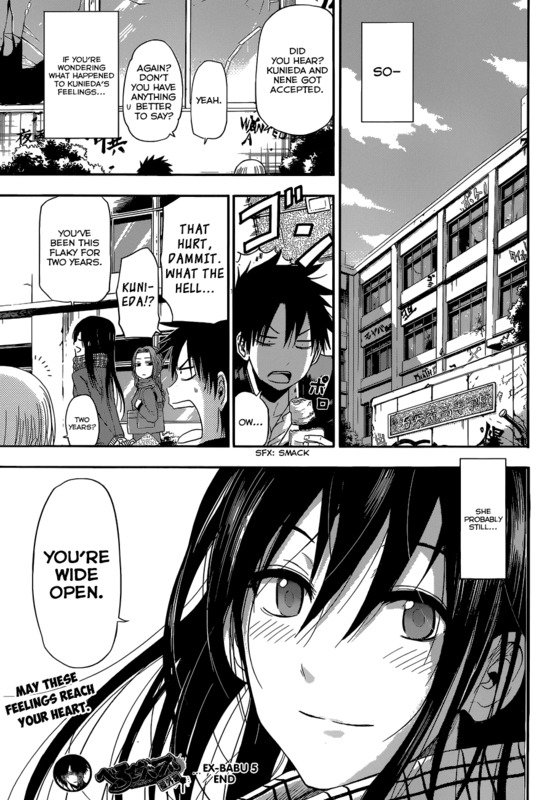 Now I call this chapter itself like above because this chapter is really dedicated to Kunieda – Oga relationship. If you are on Kunieda ship, prepare your tears please because there are touching moments in this chapter. The time event is around 1 year after final battle with Satan, where Kunieda taking university entrance exam now. 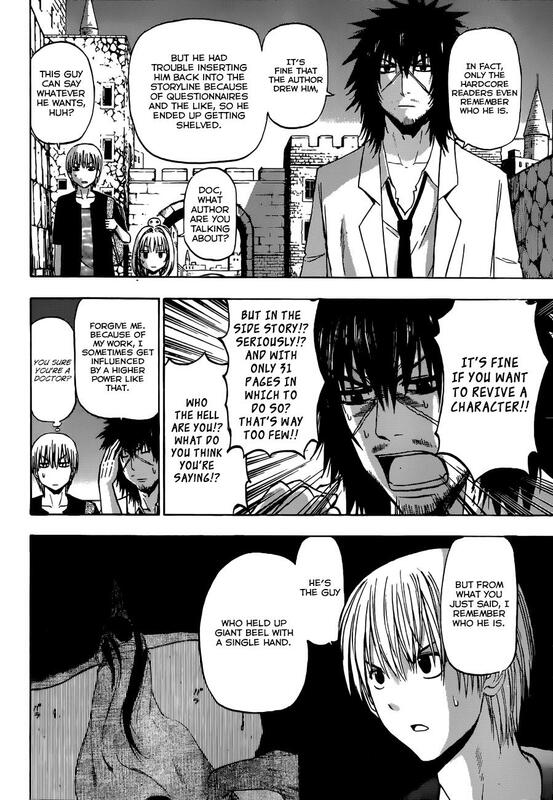 Well my favorite heroine on Beelzebub itself is Kunieda, so this chapter were really hit deep my heart. Kunieda monologues herself in this chapter is kinda ambiguous to me. But to see her smile beautifully at the last page, it's just ohhhh… Go Kunieda, Keep fighting! Look at that blushing Hilda. The last chapter of Beelzebub Bangai-hen will be about time travel things. And… It's all happened because some crazy hell's toys Demon Lord gave to Baby Beel. I think the event happened near after Kunieda arc before, where she is graduating now. Baby Beel, Oga, and Hilda are about to Time Travelling because of the hell's toys. They came back to 15 years in the past. In the story they encounter the young family of Oga where Oga was still a Baby. They need chase up missing Baby Beel that carried by Oga's mother to Singapore. Surprisingly Baby Beel they found is apparently is not the present Baby Beel, but he is the Baby Beel that Oga first encounter at side of the river on the beginning of story. They then time traveled again to the riverbank when the series began to find the present Baby Beel. Now in this arc we also can see that Hilda had her feeling increased for Oga I think. Just look at the blushing Hilda when she said 'whatever, let's go home'. Comments (0) in "Beelzebub Bangai-hen (Extra Edition) Manga (Review + Spoilers)"